Dr. Parikh is Managing Director of the Lemuir Group of Companies, a Director of the TechNova Group of Companies and Travel Corporation (India) Ltd.
Dr. Parikh has an MBA from Harvard and a PhD in Management. He is Co-founder of the World Business Academy (USA); Member, Board of Governors of the Asian Institute of Management (Manila); Founder President of the Centre for Executive Renewal (Switzerland) and Managing Trustee of the Education Foundation of India. 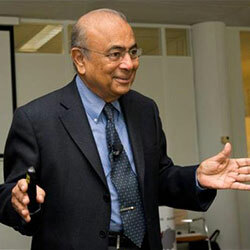 Dr. Jagdish Parikh is also a Keynote Speaker in various International Conferences. He is a Visiting Speaker at CEDEP (France), DIEU (Denmark), Euroforum (Spain), Hernstein (Austria), IMD (Switzerland), INSEAD (France), IFL (Sweden), LIFIM (Finland), London Business School (UK), Lancaster University (UK), MCE (Belgium). He is also a seminar speaker / consultant at several multinational corporations which include Ambrosetti, ExxonMobil, Gerling, IBM, KPMG, Lufthansa, Microsoft, Nokia, Novartis, Phillips, Scancem-Heidelberger, SEB, Swiss Air Group, Swiss Reinsurance, UBS, Weinerberger. He has worked in several honorary capacities for the Government of India as Chairman of FFC, now National Film Development Corporation (co-producer of the multiple Oscar winning film GANDHI); Vice Chairman of the Indian Institute of Travel and Tourism and in other advisory roles. To read more about Dr. Parikh, visit his personal site.